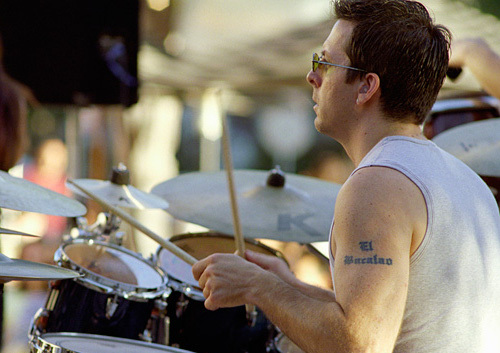 The Afro-Cuban Jazz Cartel was formed in 2007 by drummer Brian Andres and carries on the San Francisco Bay Area tradition of world class Latin Jazz. Bringing together some of the most proficient musicians in the Latin and Jazz communities of the Bay Area, the Afro-Cuban Jazz Cartel performs with one foot standing solidly in the traditions of Afro-Cuban Jazz while the other reaches for the future. Their first CD, Drummers Speak, highlights some great Bay Area percussionists: Carlos Caro, of Cuban descent; Sandy Perez, also from Cuba and former member of the world famous Cuban folkloric group, Afro-Cuba de Matanzas; Patricio Angulo, of Chilean and Colombian blood; John Ulloa, representing Mexico; and of course Brian Andres himself, born and bread in Cincinnati, Ohio. The other true highlight of this recording lies in the fact that all of the composers featured on this CD are themselves drummers - drummers whose careers have influenced Brian tremendously. As players, composers, or band leaders they have all set a standard of excellence all musicians strive to achieve. It is with much love and respect for them and their work that their compostions are featured on Drummers Speak.